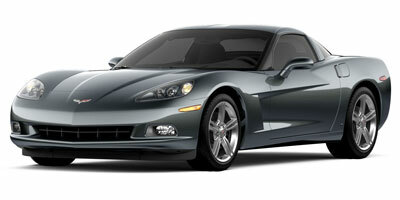 General Motors has long been celebrated for its Corvette. The car is unlike anything in the company’s stable – providing world-class performance for a fraction of the cost of more exotic metal. For 2009, the Corvette Convertible is largely a rehash of last year’s model, but Chevrolet has a well-kept performance secret on its option list. The Z51 package offers up an array of go-fast goodness for pennies compared to the street-lethal Z06 or the king of the heap ZR1. Massive brakes, a retuned suspension for more aggressive handling and package-specific transmission and rear differential gear ratios are all part of the mix. The result is a convertible that can do the 0-60 dash in around 4.3 seconds. Hands down, the Z51 package represents one of the best factory performance options out there for the money. As startling as 430 horsepower in a 3,200-lb, rear-wheel drive car is, the Corvette is incredibly mild-mannered. Your grandmother could happily drive this car all day long without giving her pacemaker a work out. The six-speed automatic transmission is buttery smooth and suspension has just enough give to invoke long distance road trips. Just like the Corvettes of old, the 2009 convertible’s interior suffers from the kind of parts-bin raiding the motoring press has bemoaned for years. 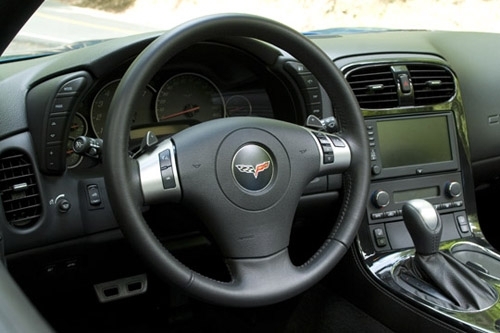 Parts like the steering wheel, engine start button and HVAC controls seem at odds with touches like great leather seats, a fantastic navigation system and attractive dash. If ever there was a vehicle to embody the Dr. Jekyll and Mr. Hyde cliché, this is it. Putter around town and the 6.2-liter V-8 under this car’s hood will gladly stay at or below 1,500 rpm. Shifts from the optional automatic six-speed gearbox breeze by without any fanfare and wind noise is manageable with the top down. Decide to put your foot to the floor, however, and you better be holding on. The Corvette comes equipped with a dual-mode exhaust system that keeps things quiet when you aren’t hammering on the throttle. Listen to your adolescent self and go for broke, and the engine comes alive by opening up the exhaust baffles and pouring all 430 horsepower onto the rear wheels. The car gathers speed brilliantly, and thanks to the upgraded suspension in the Z51 package, it can carry it through any number of apexes without breaking a sweat. It’s hard to believe this is the “slowâ€ one. General Motor’s 6.2-liter LS3 V-8 is a throwback to the old ways of Detroit power, and a marvel of modern engineering all at the same time. The pushrod beast dishes out 430 horsepower and 424 lb ft of torque, and is coupled to either a six-speed manual transmission or a six-speed automatic. Power is put to the rear wheels. You can have your Corvette Convertible with either a manual soft-top or an automatic retractable hardtop. The latter of which slides behind the rear seats quick enough to be dropped at a stoplight and comes up in about the same time. As mentioned earlier, the Z51 package serves up a laundry list of goodies that turn the already capable Corvette into a track heathen. The massive brakes swiped straight from the Z06 are perhaps the best upgrade, though the suspension tweaks and super-sticky Eagle F1 tires do much to adjust the car’s demeanor. The Corvette Convertible is available with a great turn-by-turn navigation system, operated by a bright LCD touch screen. Directions are announced aloud over the car’s audio system, as well as presented on the helpful heads-up display projected onto the windshield. Bluetooth hands-free calling and SIRIUS satellite radio round out the car’s tech suite. 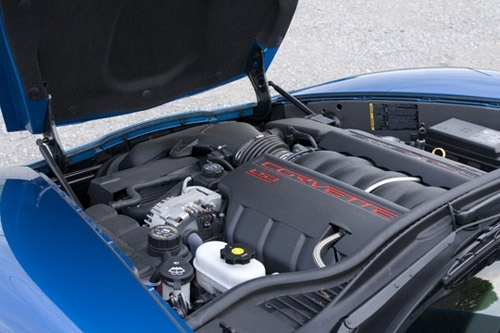 This is perhaps the most surprising part of the Corvette Convertible. Even with its massive V-8 motor, the car returns an EPA estimated 15 mpg city and 25 mpg highway. Even after a full weekend of enjoying the car’s abundant power, we saw an average of 21.9 mpg. With the top up, the Corvette Convertible is surprisingly quiet. Decide to go for a little fun in the sun, and you can easily hold a conversation even at interstate speeds. A handsome dash, comfortable and supportive seats and a surprising amount of headroom are all plusses. Outside, a strikingly styled exterior harkens back to the late ‘60s model Corvette with tall arched front fenders and four round tail lamps out back. High-intensity headlights have replaced the last generation’s flip-up models, and large, attractive wheels fill out the look. A base Corvette Convertible starts at $54,170, though the well-worth-it Z51 performance package will set you back another $1,695. While that price tag puts it on the same tier as much less capable metal, Chevrolet insists the Corvette has the equipment necessary to take on the likes of the Porsche 911 Cabriolet at $87,000 and the Dodge Viper at $91,220. 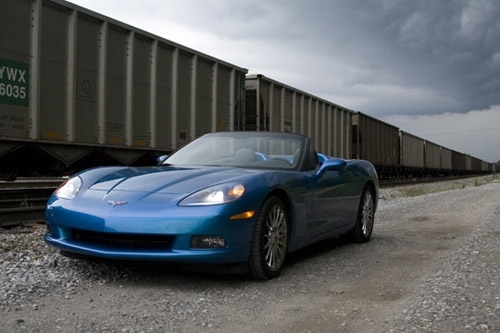 The 2009 Chevrolet Corvette Convertible lives up to the name’s reputation for unbeatable performance value. The 430 horsepower V-8 is an absolute blast in point and shoot conditions, and the Z51-equipped suspension can handle everything you throw at it and more. Best of all, livable fuel economy and a quiet street demeanor mean this is one sports car you could live with on a daily basis.